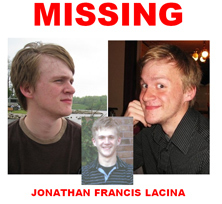 Poster being used in search for Jon Lacina. Searches of buildings on the Iowa State University campus in Ames today have failed to turn any evidence of a student who was last seen leaving a friend’s apartment on January 22nd. Twenty-one-year-old Jon Lacina of Grinnell was reported missing Saturday by his father. Iowa State University Police Chief Jerry Stewart says they will search some specific outdoor sites while stepping up other aspects of the search. He says they will continue and increase their focus on the investigative aspect of the case including electronic equipment, bank logs, dining cards, etcetera. Stewart says they plan to subpoena records to determine if there are any cellphone or bank accounts they may not have checked yet. Stewart says students now have a very big electronic footprint, and all that activity appeared to stop for Lacina the night he was last seen. Stewart says they want to be sure there are not any accounts out there they have not checked. He says a nationwide alert was sent out the day that Lacina was reported missing. Stewart says Lacina was entered as a missing person in the Iowa National Crime Information Center system, so any law officer that encountered him and ran a query, Iowa State Police would be contacted. Stewart says having a student missing for this long without contract is not normal. He says they receive requests for welfare checks on a weekly and daily basis from family and friends who are not able to contact a student, and those are usually resolved in a matter of hours or a day. “This particular case is quite unusual because, not having contact for this number of days is described as being quite uncharacteristic for Jon,” Stewart says. Stewart asks that anyone with any kind of information about Lacina to contact his office. “Even if they think it isn’t terribly significant…we would greatly welcome any report of a possible sighting, or suspicious item, or an unusual personal belonging in somebody’s yard or garage, other type of property,” Stewart says. You can call I.S.U. police at 515-294-4428, or Ames police at 515-239-5133 to report any information on Lacina.